Take two liters of warm water. Add three or four teaspoons of salt. Drink six to eight cups of this water. When you feel retching, bend yourself forward and usher. The first three fingers deeply into the mouth and give pressure to the hind part of the tongue. Water will be evacuated through vomit. Continue to usher the fingers into the mouth and vomit as long as all the water in the bowels is evacuated. Vaman dhauti should be practiced on an empty stomach. In this technique, water should be drunk swiftly. The finger-nails should be well manicured. Food should not be taken for half an hour after vaman dhauti. Persons suffering from peptic or gastric ulcers, high blood pressure, heart disease and hernia are advised not to practice vaman dhauti. Repetition: Usually once a week. The digestive organs become active. Toxic elements, acids and gas are eliminated from the bowels. Vaman dhauti gives relief in the diseases such as indigestion, chronic cold and asthma. 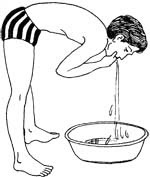 Varisar dhauti is an excellent technique to evacuate and cleanse the gastrointestinal tract completely. Take bucketful warm water having some salt in it. Try to keep your mind calm and steady. Swiftly drink two glassful of the water.